Draft: 2013, Chicago White Sox, 3rd rd. Single … Twitter: @Jacob_May1 ... Attended Coastal Carolina University, where he was named Second Team All-Big South as a junior in 2013 ... Led the Chanticleers in average (.324), hits (70), triples (2), homers (7), multihit games (19), slugging pct. (.495), and steals (16), and reached base in a career-best 27 straight games ... Father, Lee May Jr., was the 21st overall pick in the 1986 draft by the New York Mets and batted .221 (469-2120) over eight minor-league seasons … grandfather, Lee May, hit 354 home runs over 18 major-league seasons for Cincinnati (1965-71), Houston (72-74), Baltimore (75-80) and Kansas City (81-82) … uncle, Carlos, played 10 MLB seasons with the White Sox, Yankees and Angels, and currently serves as a Sox ambassador. Spent most of the season with Class AAA Charlotte after starting the season with the White Sox ... Made the Sox Opening Day roster … started the season hitless over his first 26 at-bats, the second-longest hitless stretch by a Sox non-pitcher to open his career behind OF Randy Moore (0-32 in 1927-28) … source: Elias ... Was the White Sox Opening Day center fielder on 4/4 vs. Detroit … drove in his first career run with a RBI groundout … scored his first career run on 4/6 vs. the Tigers ... Recorded his first major-league hit, a pinch-hit single, in the seventh inning on 4/22 vs. Cleveland, snapping his 0-26 seasonopening hitless streak ... Drove in Chicago's only run with a RBI single on 5/1 at Kansas City … was optioned to Charlotte following the game ... Ranked among the International League leaders in sacrifice hits (1st, 17) and stolen bases (2nd, 31) ... Ranked among the Knights leaders in triples (1st, 5), steals (1st), hits (2nd, 103), games played (4th, 110) and runs scored (5th, 54) ... Made 91 starts in center field, 16 in left and one as the DH ... Batted .272 (103-415) with all four home runs vs. right-handers (.188 vs. lefties) … hit a season-high .294/.379/.461 with three home runs and eight RBI in 26 May games ... Hit safely in each of his first 12 games with the Knights, going 18-51 (.353) with three doubles and four RBI ... Walked four times on 5/18 at Norfolk, drove in a season-high three runs on 6/15 vs. Louisville and collected four hits on 7/7 vs. Louisville ... Recorded a 10-game hitting streak from 5/29-6/7 (.268, 11-41). Was limited to 83 games with Class AAA Charlotte due to abdominal injuries … led the Knights with 19 stolen bases.  Batted .314/.339/.410 in the second half after hitting .240/.294/.321 prior to the break … went 4-11 (.364) with seven RBI and eight runs scored with the bases loaded.  Recorded an eight-game hitting streak from 4/13-21.  Was on the disabled list from 5/16-6/20 and 7/16-8/9 with abdominal strains  Hit safely in 14 of his final 15 games, including a season-high, 11-game hitting streak from 8/20-9/1 (.422, 19-45) … posted five consecutive multihit efforts from 8/23-28.  Entered the season ranked by Baseball America as the No. 5 prospect in the White Sox organization … also tabbed by MLB. com as the No. 8 prospect in the Sox system. Batted a combined .274 (111-405) with 16 doubles, two home runs, 35 RBI and 39 stolen bases over 101 games between Class AA Birmingham and the Arizona Rookie League White Sox ... Tied for second in the Southern League with 37 steals, trailing only teammate Tim Anderson (49) … batted .338 (24-71) against lefties and .311 (42-135) in 33 games as the leadoff hitter ... Was placed on the disabled list on 6/3 with a concussion suffered on 6/2 vs. Biloxi after colliding with Tim Anderson ... Hit for cycle on 8/11 at Pensacola. Ranked third in the Carolina League in stolen bases (37) and tied for third in triples (10) at Class A Winston-Salem ... Led the Dash in runs scored (66), stolen bases and triples … was successful on 82.2 percent (37-45) of his steal attempts. l Was named CL Player of the Week for 8/4-10, going 16-30 (.533) with four doubles, two triples and nine steals ... Was placed on the disabled list on 8/9 with a bruised right pinky finger and missed the rest of the season. l Entered the season ranked by Baseball America as the No. 10 Prospect in the White Sox organization. Combined to hit .303 (76-251) with seven doubles, four triples, eight homers, 35 RBI, 41 runs and 24 steals over 66 games between Advanced Rookie Great Falls and Class A Kannapolis ... Tied for sixth among White Sox farmhands in steals ... Was named SAL Batter of the Week for the period of 8/19-25 ... Hit .443 (27-61) during a 15-game hitting streak from 8/13-28. l Played for Sydney in the Australian Baseball League, hitting .269 (49-182) with 17 stolen bases in 45 games ... Was cited by Baseball America as the Fastest Baserunner and Most Intriguing Background in the White Sox draft class ... Was recommended/signed by Kevin Burrell (White Sox). July 28, 2018 Charlotte Knights released LF Jacob May. July 2, 2018 Charlotte Knights activated LF Jacob May from the 7-day disabled list. June 23, 2018 Charlotte Knights placed LF Jacob May on the 7-day disabled list retroactive to June 20, 2018. January 22, 2018 Chicago White Sox invited non-roster OF Jacob May to spring training. January 18, 2018 Chicago White Sox sent LF Jacob May outright to Charlotte Knights. January 11, 2018 Chicago White Sox designated CF Jacob May for assignment. October 2, 2017 Chicago White Sox recalled CF Jacob May from Charlotte Knights. August 1, 2017 Charlotte Knights activated CF Jacob May from the temporarily inactive list. July 27, 2017 Charlotte Knights placed CF Jacob May on the temporarily inactive list. May 2, 2017 Chicago White Sox optioned CF Jacob May to Charlotte Knights. November 18, 2016 Chicago White Sox selected the contract of Jacob May from Charlotte Knights. August 9, 2016 Charlotte Knights activated CF Jacob May from the 7-day disabled list. July 16, 2016 Charlotte Knights placed CF Jacob May on the 7-day disabled list. June 20, 2016 Charlotte Knights activated CF Jacob May from the 7-day disabled list. May 16, 2016 Charlotte Knights placed CF Jacob May on the 7-day disabled list. April 6, 2016 CF Jacob May assigned to Charlotte Knights from Birmingham Barons. 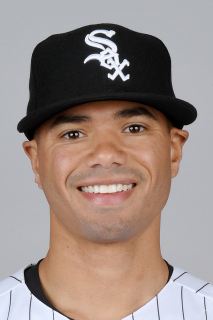 January 26, 2016 Chicago White Sox invited non-roster CF Jacob May to spring training. September 21, 2015 OF Jacob May assigned to Glendale Desert Dogs. July 23, 2015 Birmingham Barons activated CF Jacob May from the 7-day disabled list. July 18, 2015 Birmingham Barons sent CF Jacob May on a rehab assignment to AZL White Sox. June 3, 2015 Birmingham Barons placed CF Jacob May on the 7-day disabled list. Concussion. April 9, 2015 CF Jacob May assigned to Birmingham Barons from Winston-Salem Dash. March 12, 2015 CF Jacob May assigned to Chicago White Sox. September 2, 2014 Winston-Salem Dash activated CF Jacob May from the 7-day disabled list. August 9, 2014 Winston-Salem Dash placed CF Jacob May on the 7-day disabled list. April 1, 2014 CF Jacob May assigned to Winston-Salem Dash from Kannapolis Intimidators. July 3, 2013 CF Jacob May assigned to Kannapolis Intimidators from Great Falls Voyagers. June 19, 2013 Jacob May assigned to Great Falls Voyagers. June 15, 2013 Chicago White Sox signed OF Jacob May.